The winners of the second annual “Future of Shade” contest sponsored by Sunbrella® fabrics and Architizer™ were announced today, with winning designs coming from global shade innovators in China, Portugal and Mexico. Selected from more than 140 entries, the winning designs approach shade from humanitarian, leisure and commercial construction angles. The winner of this year’s top prize, $10,000 in cash, is Hong Kong-based Architect Tony Leung’s Xafari Modular Rainwater Harvesting Pavilion, which will be included in a showcase of more than 20 contest entries at AIA in Chicago. Noting the way that water beads and rolls off of Sunbrella fabric’s moisture-resistant surfaces, Leung conceived a design with a humanitarian goal: to collect water, the world’s most precious natural resource. The resulting series of inverted, retractable “un-brellas” catch rainwater and funnel it through bamboo or steel pipes into buried storage bottles that can later be drawn by a lever pump. Thirty-three modules can cover a six-foot by six-foot area and also provide shelter. In addition to Leung’s pavilion, the competition sparked a wide range of new uses for Sunbrella fabrics, including Mexico’s Rojkind Arquitectos and their Honorable Mention for the Yanay Hotel proposal. Spread across the meditative landscape of Amatlán, it consists of 19 individual bungalows, each comprising a stone foundation and a polygonal reinterpretation of the traditional fabric tent. Sunbrella textiles stretched over a metal frame, sculpted to feature protrusions that end in openings that let in natural light while affording views of the surrounding mountains and sky. At night, the interior lighting shines through the fabric exterior to create the effect of luminous, large-scale jacks spread across the landscape. Portugal’s Joao Araujo Sousa Arquitecto also received an Honorable Mention for Flagship, a project pairing the transparency of glass with the shade provided by weather-resistant Sunbrella Marine 60” Natural fabric. Ideal for coastal sites, the firm’s design allows visitors to look outward from the structure’s glass walls while sitting on Sunbrella-upholstered benches. Overhead, a series of 240 suspended flags protects the interior from overexposure, while casting rhythmic shadows that change throughout the day as the sun progresses through the sky. Given the overwhelming response to the competition, the jury chose to recognize four other firms for the innovation of their submissions. London’s Marques and Jordy was recognized for Petals, a modular, flexible, highly versatile pavilion that can provide shade across a wide spectrum of terrains, from a garden estate to an arid desert. 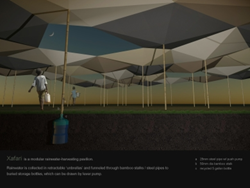 Canada’s University of Waterloo architecture student Felix Cheong created Revolving Canopy, a cylindrical transit shelter that uses Sunbrella as an adaptable protection from the elements. Ty Harrison of Los Angeles’s Whipple Russell Architects used Sunbrella as Gullwing, an operable retrofit for overexposed building facades, while Ekachai Pattamasattayasonthi of Washington, D.C.’s Stapanik Design Studio created WoPoRo. The new product is an experiment in Sunbrella’s woven porosity, taking strips of the fabric and recomposing them to explore varying levels of translucency and create new patterns on its surface. Sunbrella fabrics are manufactured and marketed by Glen Raven, a 134-year-old family-owned company based in North Carolina with operations worldwide. For more information on the Sunbrella brand, including fabric resources, visit http://www.sunbrella.com.